Television uses a video output. Radio uses sounds to promote a product. Newspapers print advertisements in a space in their issue. Flyers and online ads have come into existence. These ads are becoming more common as they aim to get our attention. 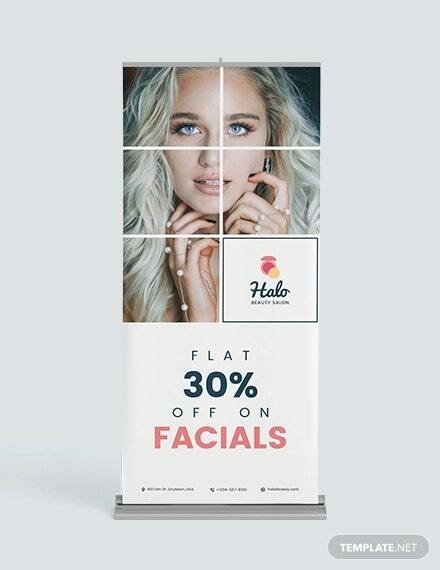 Another form of advertising exists through roll up banners. If you have walked inside a mall and there is an ongoing event, you see these banners standing beside the people who are under its company of origin. These are used to promote the product in its most effective way. 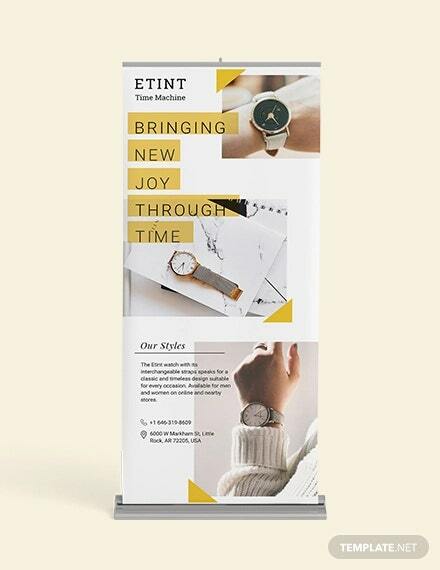 A roll up banner is a portable advertising display commonly used in public events. It has two metal holders that hold the banner ad when it is used for display. 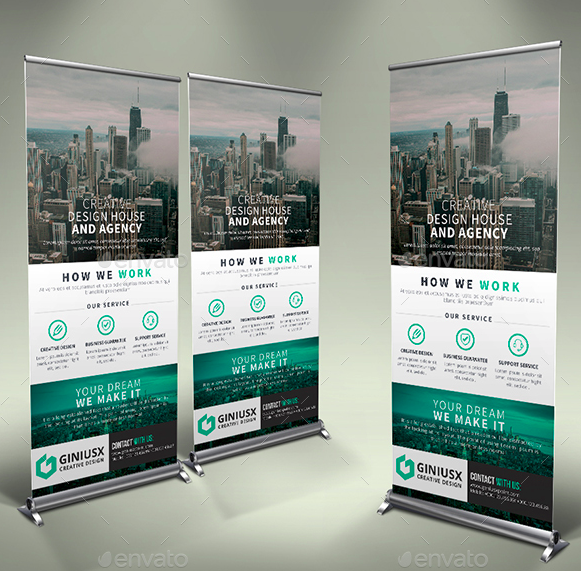 The metal holders on both poles of the banner are adjustable. 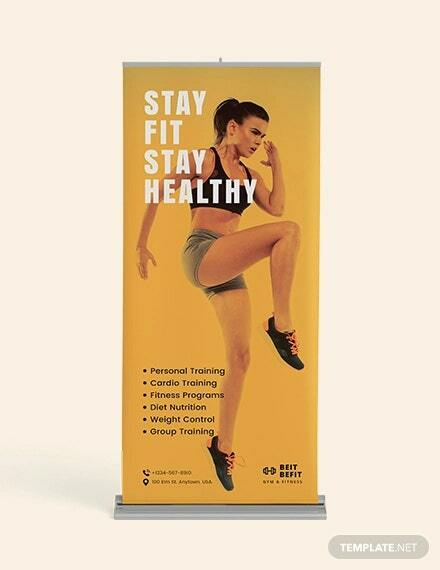 The roll up banner is made of polyester fabric and polyvinyl chloride or PVC vinyl. Its standard size is 850 millimeters (mm) wide by 2000 mm high. This is the most popular size being used. 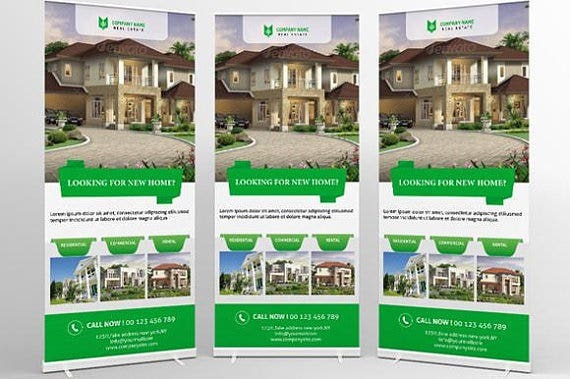 Two other standard sizes for roll up banner ads are 650 mm wide by 1700 mm high, and 1000 mm wide by 2200 high. 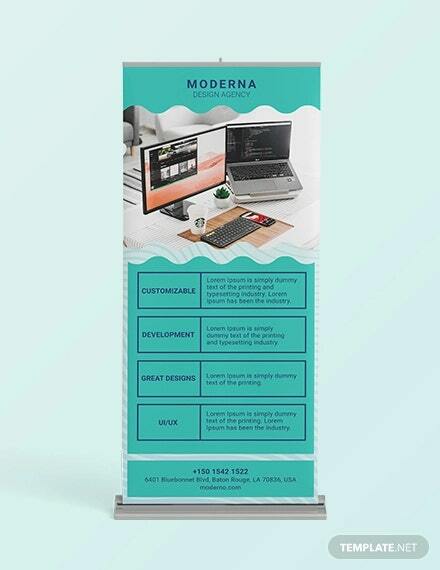 Roll up banner ads are more commonly seen in exhibits, business conferences, restaurants and coffee shops, opening of new establishments, school events, and trade fairs. Religious organizations use roll up banner ads in their worship events to invite more people. Shopping centers use these as well when they have sale on their products. These are usually seen at the entrance of any establishment. 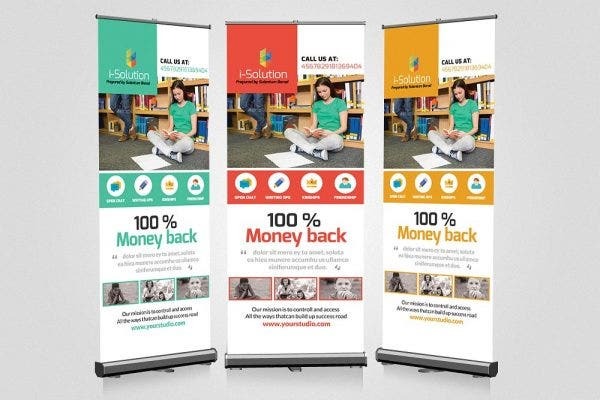 Roll up banner ads get the message to its audience swiftly and effectively. It just have to be designed well by anyone by the company. 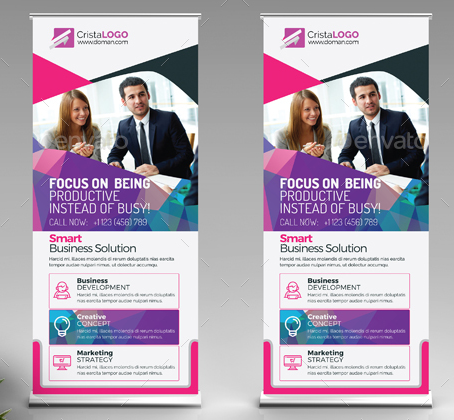 There are several templates for roll up banner ads available online. If you are looking for a pre-made design, make sure the color scheme is customizable and it fits with the right size of your material. Most templates can be easily customized and does not take up so much time when you change its design. 1. Put the logo at the top. The first attraction that people see in a roll up banner ad is the logo. It is the company’s emblem and identification in the business world. In ads like this, the logo is always put at the top. A roll up banner ad stands in almost the same height as a normal person. The top part should also display the core message of the ad. Make sure it meets the person at eye level. It grabs a person’s attention when he walks past it. 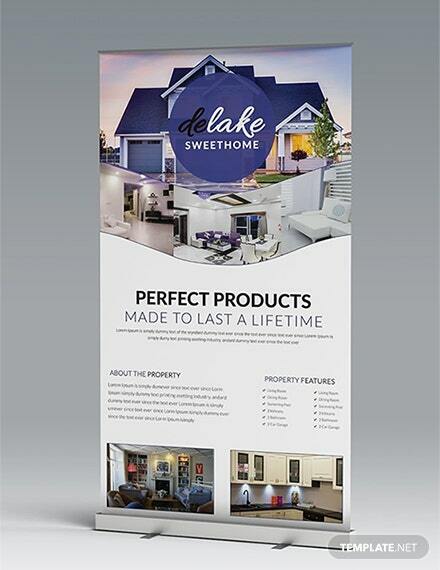 Roll up banners are a tangible form of advertisement. The information you include in it is highly important. These include the image of the product, its specifications and prices. You also have to keep the words at a minimum since there is only limited space. Make sure that the words you write in the ad can incite a call of action to the people’s end. Colors attract the eyes. 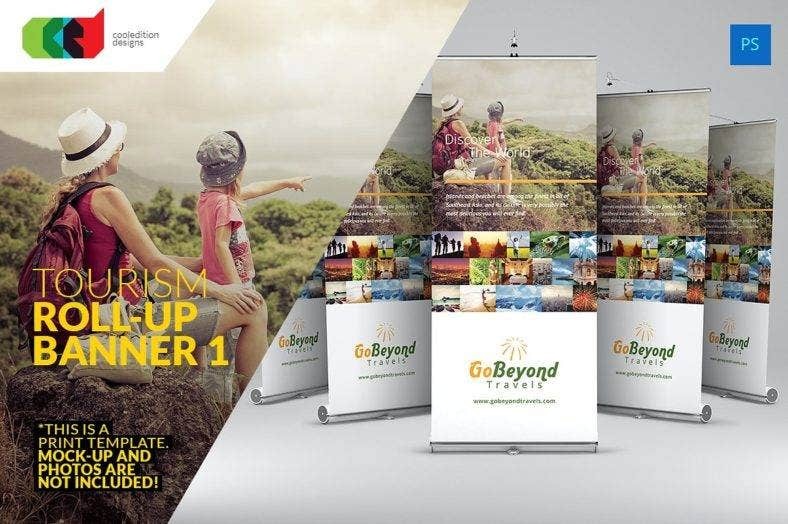 Bright colors are mostly used in roll up banner stands for it to stand out. One tip in dealing with colors for ads like this is to tone it well with the company’s corporate message. Use colors appropriately. It is a big factor for the attractiveness in your ad. For example, red and orange can be used together to invite attention. Both colors are bright and can be appealing to the eyes. 4. Maximize text and spacing. 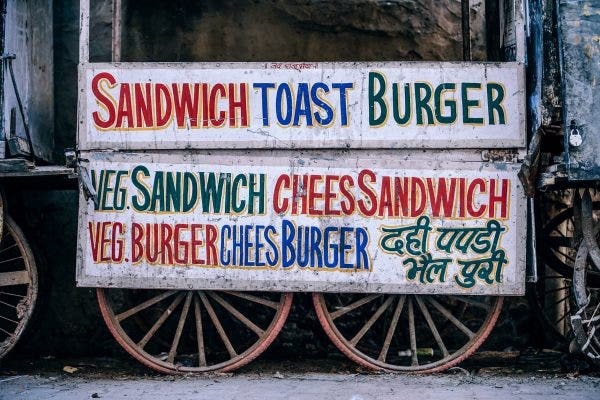 Typography is another key to a successful advertisement. May it be clean, simple, beautiful or elegant fonts, you need to know how to use them to its maximum potential. Use clean and readable fonts so people won’t have a hard time reading it. Arrange it well so it won’t get in the way with your ad’s images. Take note of any errors in spelling and grammar and change if there is one. Typography can make your ad successful or a total mess. 5. Use high quality images. Aside from colors, images can attract a person when he sees an ad. This the best visual that you can ever put in an ad to gain the attention it deserves. 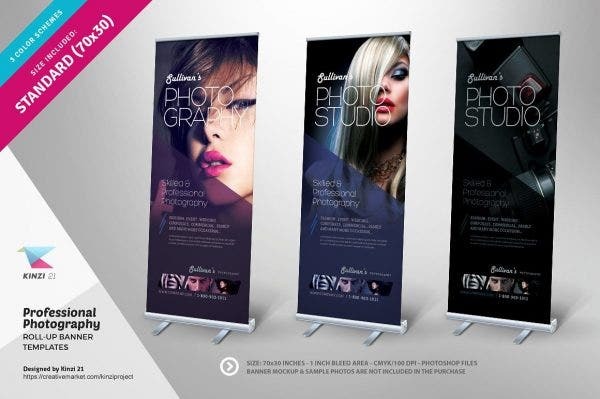 Use high quality and beautifully shot images to go with your banner ad. As much as possible, use your own image. Getting one from the internet might turn out low in quality once it gets printed in the ad. 6. Use a certain styling technique. Every graphic designer has his own technique in designing a product. Other times, he uses a way of designing that is in line with the brand being promoted. As for your own technique, design the banner ad in the best way you know. You need to measure the specifics in the overall design to make it look beautiful. When you don’t know how to design the banner ad properly, take a high risk by experimenting on the design. Make sure it does not go overboard and malign the company’s core values and message. Create a design that is attention-grabbing and innovative at the same time. 8. Do not overcrowd your ad. As with most principles in graphic design, do not ever put too much information in your ad. Just the right amount of it will suffice. Overcrowding your ad with so much text and images irritates anyone who sees it. Make the ad minimal and effective all at once. Contact information should be at the bottom of the ad. Include your phone number, email, website, social media pages (Facebook, Twitter, Instagram and LinkedIn) and address so people would know where to contact you when they are interested in your ad. Roll up banner ads don’t need heavy manpower to be set up. You can just buy it anywhere and use it depending on your convenience. 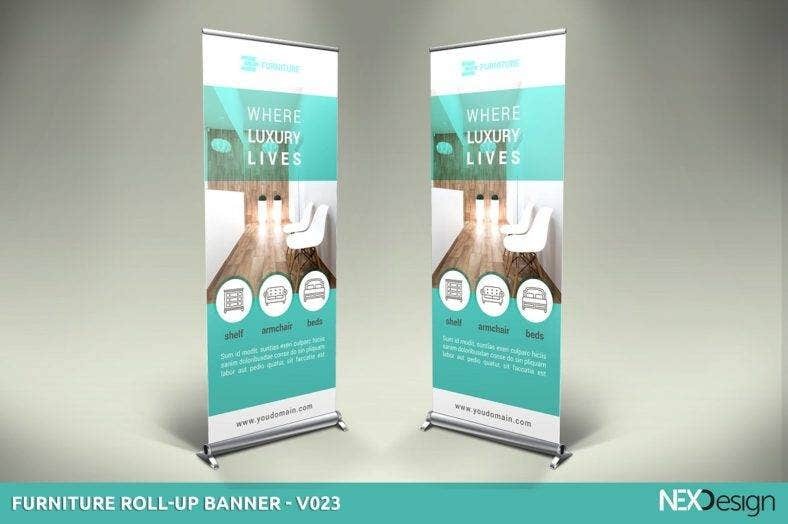 Roll up banner ads are easy to carry around. The weight depends on its size. 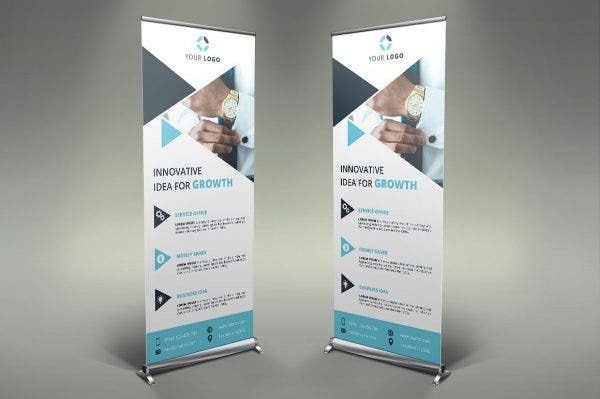 Based on the name itself, these banners are rolled up and carried around in exhibitions if it is used in a regular basis. 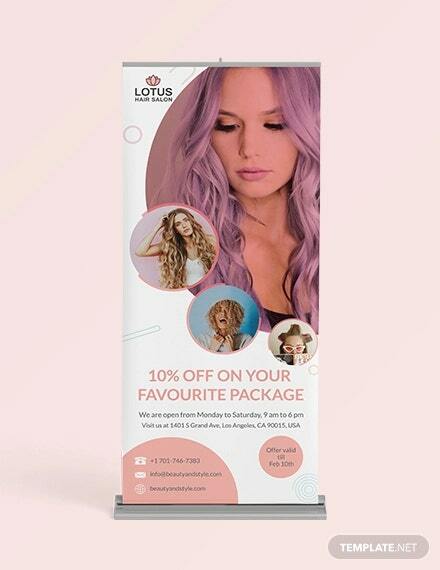 The design and materials of a roll up banner is lightweight so it doesn’t take much effort to carry it around. It also does not take up much space when you put it in the office. You can put it anywhere in the office as long as the space is safe and dry. 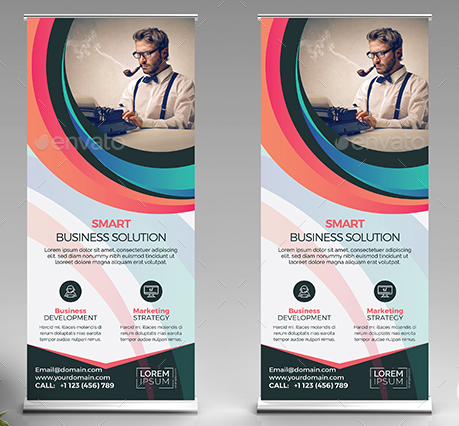 As you can see, a roll up banner ad is pulled on one end and slot a telescopic pole in place where you put the part that you pulled up. It is retractable. 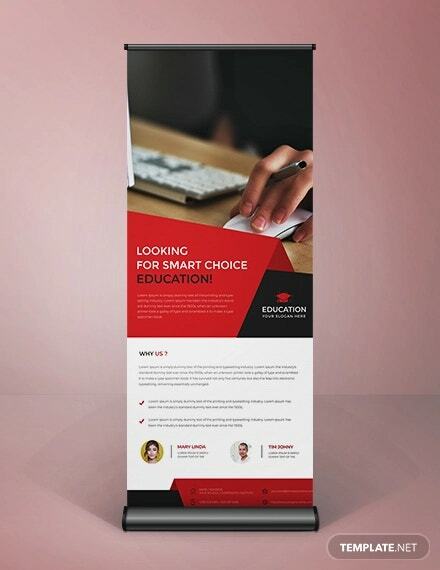 The pole at the back and the flat base support the banner ad and keep it from falling. It is easy to assemble in just a few steps. 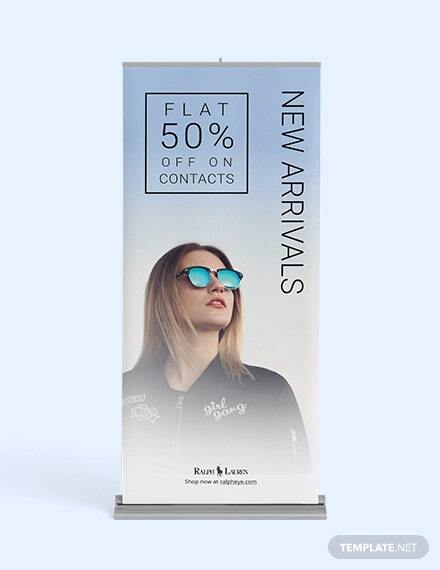 Roll up banner ads are durable because of its vinyl material. Aside from that, the base of the banner is sturdy enough to hold its weight. That is the reason why you don’t see any roll up banner ad fall easily. These can stand for a long time from the start to the end of the event. 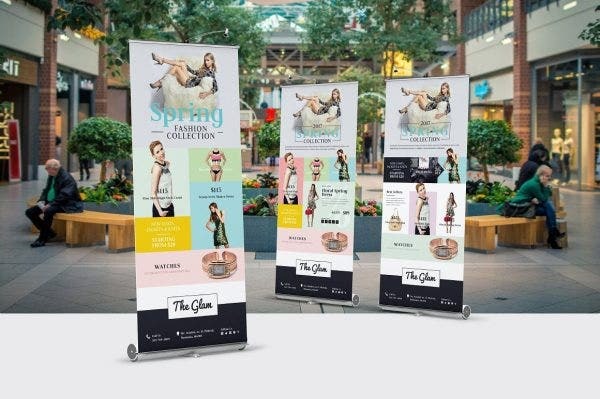 Unlike television, online and radio ads which shelf life ends once it is done airing, roll up banner ads can be used and reused for events. This makes the shelf life longer than other forms of advertisements. It has the right message and it does not have any expiration date, or length of time that it should be present in the airwaves. It can be used as long as you want and how many times you want to. Advertising through roll up banner ads does not cost that much. Another thing that adds up to its value is it can be seen over and over again. You can even move the banner to the place where the situation demands it to be put. It is effective and it can be seen by how people stop by to read the whole ad. 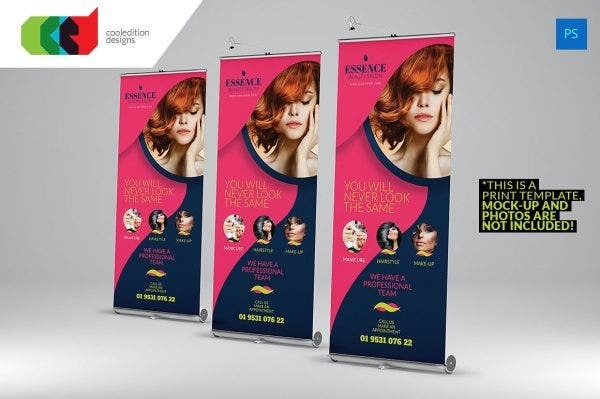 Wherever you go and whatever the situation demands, a roll up banner ad can create the brand awareness for your product. You can take it anywhere from a talk show to a trade event, as long as these are kept properly and decently designed by the designers themselves. These ads also make it easy to promote your message. 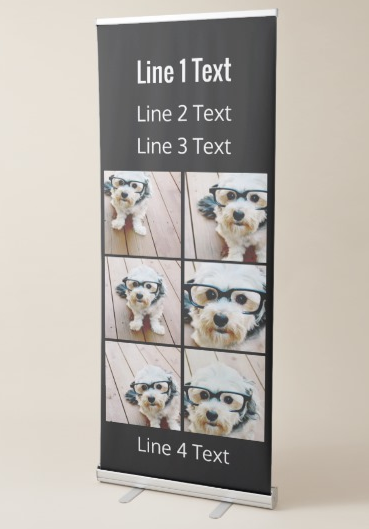 Roll up banners have several uses. Its primary use is to market and promote a product, event or a service. To do so, effective writing skills must be used in writing the content of the ad. You have to know how to write concisely about a product without the risk of telling too much and too little. This is the quickest way to send a message without being too wordy and preventing any shock value to its audience. 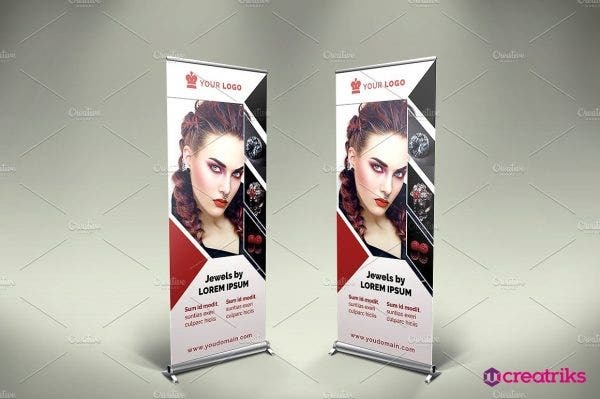 Aside from that, roll up banner ads also provide details of an event such as the venue, date, time and what the event is all about. All the contact information is displayed in the banner ad so there’s no excuse not to reach these numbers and email addresses. 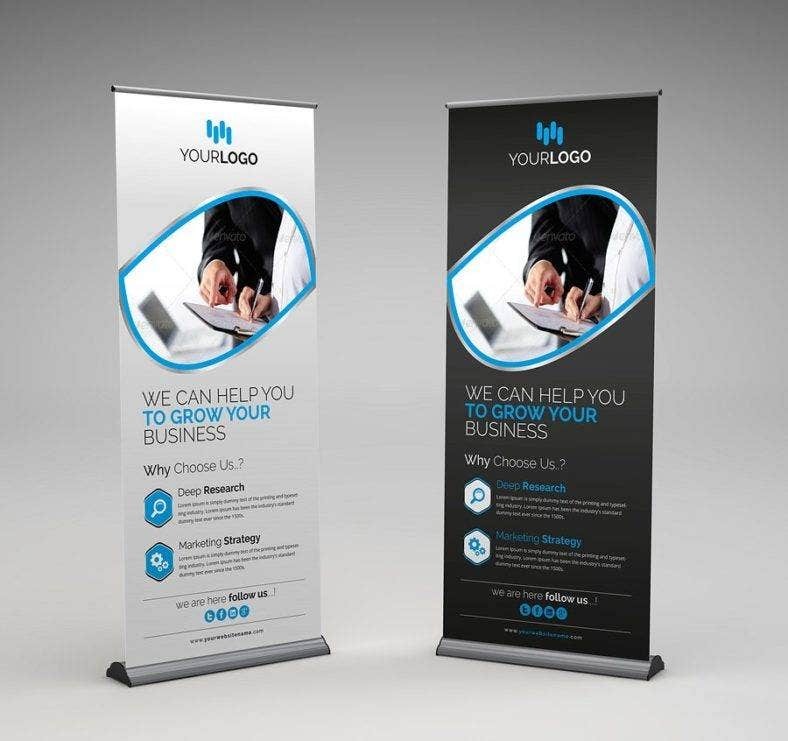 A roll up banner can be used as advertising but with a different peg. In the design, you can write about the benefits of using a product and listing the things that are not part of your service anymore. This is a form of sending a message in a different but more detailed way. As always, it is written in a straightforward manner to avoid being ignored by the people. 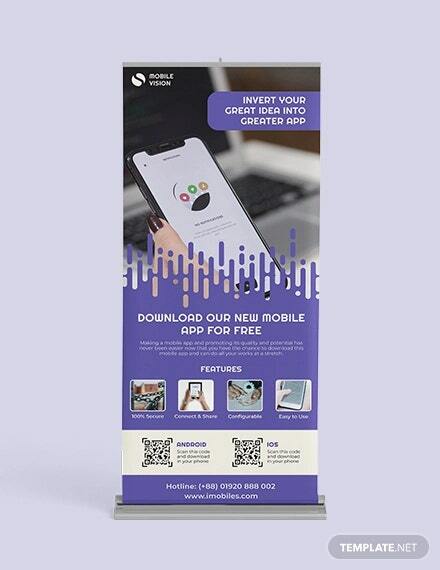 Another use of a roll up banner is to highlight the company profile and its recent activities. People have to know what the company is up for aside from the promotions it does to the general public. Furthermore, it can also be used as an educational tool to shed light on some important topics. This is pretty much applicable in educational fairs. However, the writing should be direct to the point and condensed to make it easy to understand. Writing in simple words is another skill a designer should master. Whichever purpose a roll up banner ad maybe used, it should get the message to the audience quickly. People’s attention spans are not the same all the time. 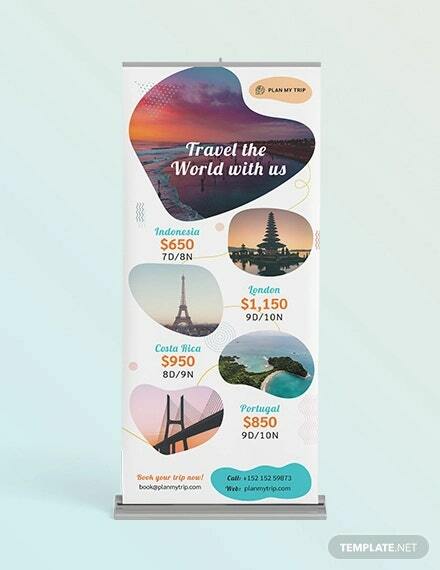 There are several things to consider when you choose a banner for your ad. It is very confusing to decide especially when there are a lot of roll up banner ads available in the market. 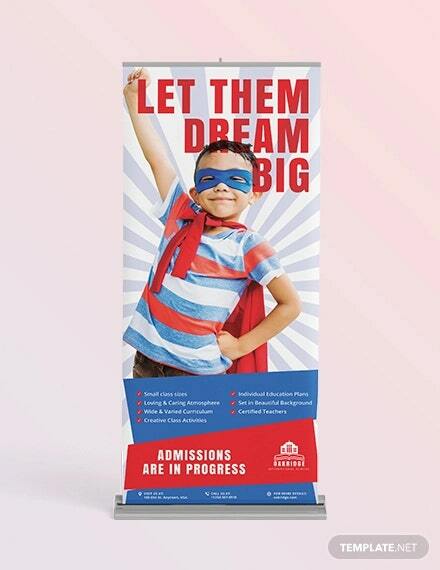 To help you with this, here are some factors in choosing the perfect roll up banner. The cost of the banner itself should matter most when you choose one. 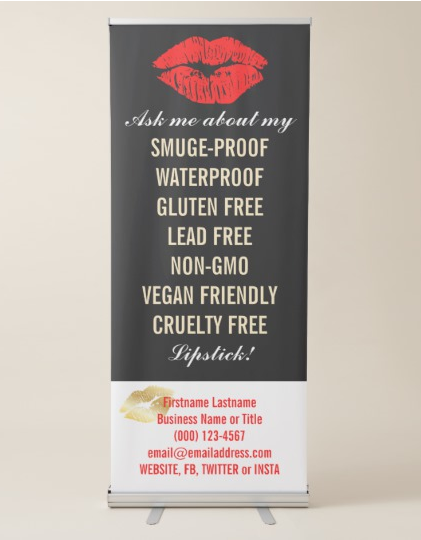 Take note of the budget you have and choose a cheap and durable banner. The banner stand is another purchase to be done so better be careful of spending your money for a banner. 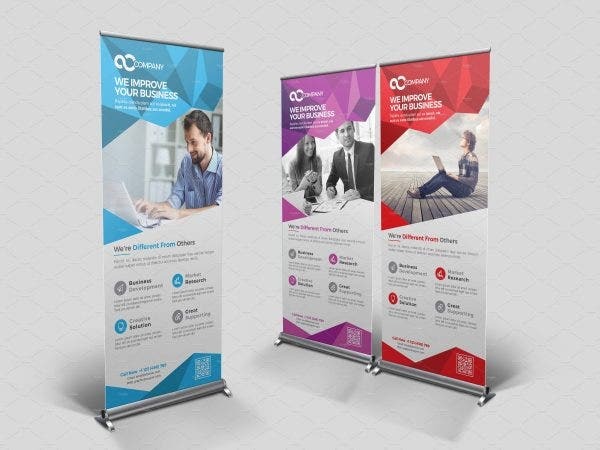 One thing to consider in looking for banners is how you want it to look. There are banners that are too flashy and some are just too simple. Choose one which is a good balance of both. Look at the bases of the stands as this would affect how it looks when the banner is pulled from the top or from the bottom. If the design of your ad is for a long format, pick a longer banner. 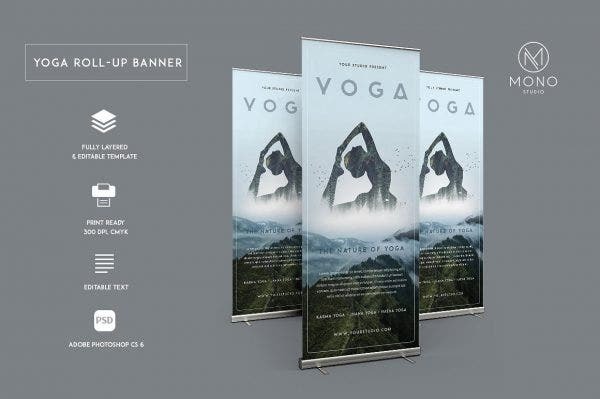 The standard length of a roll up banner is 2 meters high. 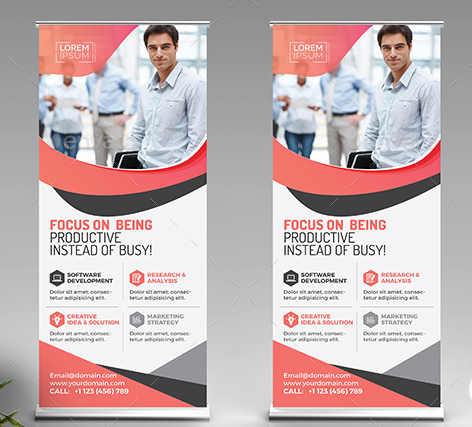 Long form banners can stretch up as high as 3 meters. 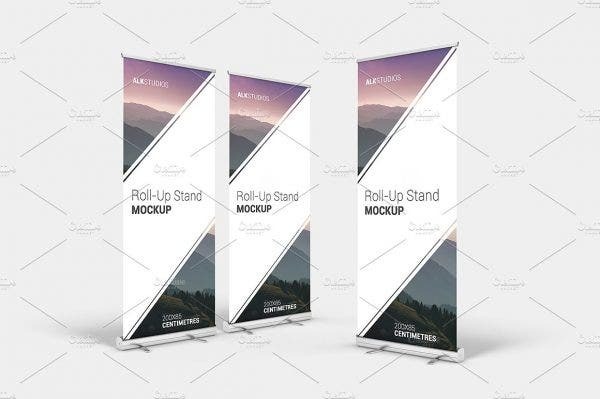 The materials for the roll up banner depends on its frequency of use. 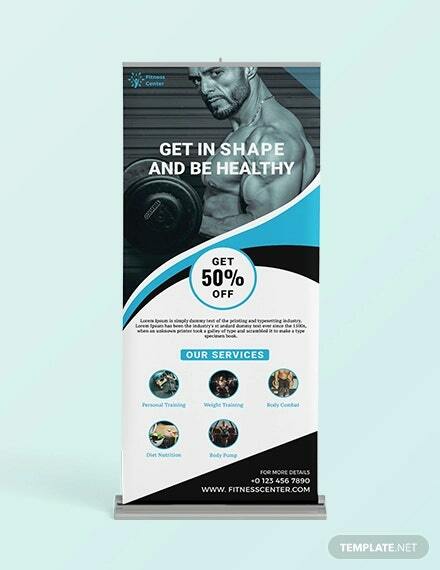 If it is used in a frequent basis, you would be most likely get a banner with sturdier material than most banners. A cheaper banner will be offered if it is just used for a few days. The materials are still durable but it cannot withstand heavy usage. You also have to consider buying a banner that is resistant to fading. Graphics can fade in time and if the banner is used multiple times. If the banner ad will be used outdoors, a banner with stronger materials will be used. It can withstand weather changes, pollution and occasional falling. Do not settle for a vague goal. Saying that the ad aims to increase social media following is not enough. Instead, make a goal to increase social media following of your company by 90 percent. How you do that depends on the ad you give out to the people. By having a clear goal, you would know what to do and use techniques to further improve your ad. 2. Be patient in the coming days. By being patient, it means giving your ad a chance to do its magic after you put it out in the open. The effect of advertisements can be growing or delayed. Do not overthink if it will succeed or fail. Just let it be. Because what is meant to happen will really happen. Do not take it back once it begins to work its own magic. And most importantly, advertisements don’t equate to instant success. It needs work and patience to see where it goes. 3. Track and measure the progress. As the days go by, you need to track the progress of the advertisement. Although nothing is certain, it can give you an idea on where you are heading and what you should improve in your next ad release. The present progress can change at any moment so you have to keep a closer look at it. 4. Make a “before and after” diagram. The before and after diagram helps you in measuring what works in your ad and what does not. It further gives context on the progress and changes your advertisement has made in the market. The impact of the ad is also determined in the diagram. Aside from the numbers, surveys are also effective in making the before after measurement. Ask the customers how they heard about the product or make an online poll to be voted by any netizen. 5. Compare before and after website traffic. Most businesses have set up websites so people can have something to refer or go to using their mobile phones and computers. Website traffic is one of the most important measurements of the success of an advertising campaign. It matters when a site reaches the top spot in search engine results. With this, have a clear demographics and gather data of website traffic from before and after release of the ad. Based on the numbers, the performance of the website from the ad’s overall effect is determined. A successful advertising campaign will surely increase the website traffic. People would surely go to the website to know more about the product. Getting and mastering the basics of advertising using a roll up banned ad can help your product really well. It promotes the product in its best quality and calls people to action. Making the ad just right is the best way to maximize the potential a roll up banner ad can give.